Does the G 310 GS replicate the premium experience of the larger GS models in a smaller and comparatively more affordable package? The G 310 GS is expensive alright, but the high asking price didn’t come as a surprise to fellow motorists who enquired about it. We believe the badge has to do something with it. Like the other two German auto manufacturers, BMW is a recognised auto brand in India. So the fact that a BMW bike costs Rs 4.2 lakh (on-road) seems to be a somewhat digestible fact around commoners. Likewise, it is assumed that the bike will offer a premium experience worthy of the BMW badge. Is that the case then? Let's start with the looks. This is one department where the G 310 GS impresses. Despite having the same frame and motor as the G 310 R, the G 310 GS looks substantially larger and taller. Compared to the more compact R, the baby GS features wider and edgier body panels that make it look beefy without appearing bulbous. Fit and finish is worthy of the BMW tag with high-quality plastics that feel like they would last a lifetime. We loved the tight and even panel gaps - full marks to BMW for quality. This is a tall bike and by extension has a tall seat height of 835mm. That is taller than both the Royal Enfield Himalayan’s 800mm seat height and Kawasaki Versys-X 300’s 815mm seat height. I am 5ft 8in tall and still had issues placing both feet flat on the ground. It is manageable though, as the seat is narrow at the front so you are not left clawing for the ground at traffic lights. BMW have got the seat cushioning spot on making it supremely comfortable. And though you have a nice wide handlebar, we would have liked for it to be positioned a bit higher for better off-road rideability. The riding position is properly upright and coupled with the comfortable seat, it makes for almost fatigue-free riding. Sadly, your pillion won't be as happy as you on long journeys despite the wide seat and chunky grab rails. That's due to the high pillion footpegs resulting in a cramped, knees-up seating position. Switchgear is the same design as that of the TVS Apache RR 310, thanks to the platform sharing agreement between BMW and TVS. However, the switchgear quality and tactile feel on the BMW is a couple of notches higher and amongst the best we have seen. We loved the serrated footpegs that are fantastic for off-road use. You get rubber inserts for on-road use and these reduce vibrations to a great extent. This is one area where the G 310 GS disappoints. Despite being an all-new design and being billed as premium, BMW has skimped out on LED headlamps or turn indicators. The headlamp is also disappointing in terms of its brightness and spread. The throw is quite high to be useful and shakes everytime you go over a bump. It does get an LED tail lamp though. Given the premium pricing, we would have loved to see at least a pair of fog lamps like the ones on the Versys-X 300. It also misses out on engine protectors, a proper metal bash plate and spoked wheels, whereas both the Himalayan and the baby Versys feature the latter featuring. The instrument cluster displays the speed, revs, kilometres covered, gear position, fuel level, range and time. Interestingly, the engine redline is indicated by a small snowflake shaped indicator that glows white. The motor is familiar as the TVS Apache RR 310 uses the same liquid-cooled single-cylinder engine which we have extensively ridden. However, the BMW powerplant uses a different ECU setup from Magneti Marelli as well as different final drive ratios. The difference in ECU tune makes the BMW feel a tad more refined than the Apache, but the motor still is buzzy. The 313cc liquid-cooled motor is reverse inclined, so the exhaust port sits at the back of the motor instead of the front as seen on traditional engines. This allows for efficient cooling, like the Apache RR 310. It makes 34PS at 9500rpm and 28Nm of torque at 7500rpm. The G 310 GS does not have the initial pep of the Apache RR 310, but it feels more relaxed at cruising speeds of 80-100kmph. 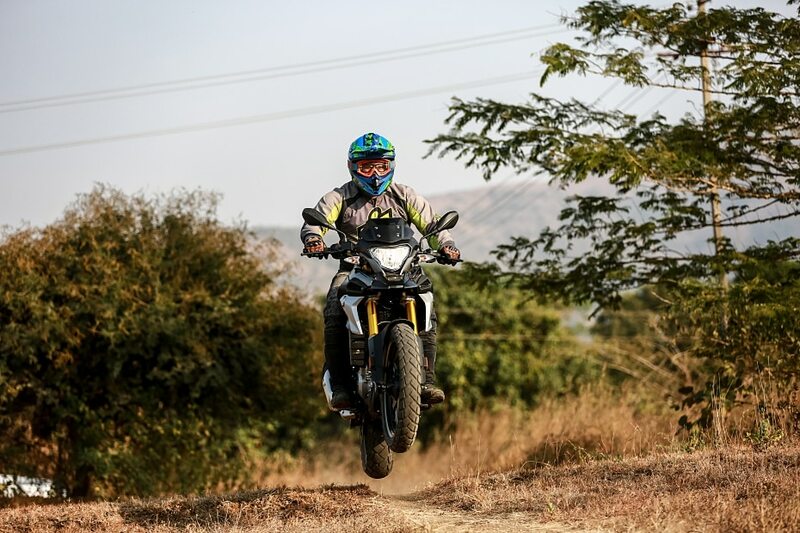 Under our acceleration tests, the G 310 GS went from 0 to 60kmph in 3.12 seconds and 0 to 100kmph in 7.57 seconds. That makes it 0.29 and 0.73 seconds quicker than its competition, the more powerful Kawasaki Versys-X 300, in the 0-60kmph and 0-100kmph acceleration runs respectively. The reason being that the BMW is lighter and makes max power and torque at lower revs. It loses out to the Versys-X 300 in the roll-on tests though. 30-70kmph in third gear takes 4.25 seconds and 40-80kmph in fourth takes 5.23 seconds which is 0.36 seconds and 0.27 seconds slower than the Versys-X 300 respectively. That's because the Versys-X is running shorter gearing. The BMW’s relaxed gearing though allows it to cruise at relatively lower rpm and that shows in the fuel efficiency. In our tests, it returned 31.94kmpl on the highway at speeds close to 90kmph. Though the motor does feel buzzy at those speeds, it is not as bad as the Apache RR 310. You still have to contend with vibrations at the bars, footpeg and fuel tank. But they get a lot more pronounced when cruising at 100kmph in sixth gear, with the engine doing 6000rpm. And if you’re planning any long distance touring, you’d better ensure that you have the rubber inserts back in the pegs, as they get super tingly without them at those speeds. But for long distances, the other major drawback is the 11-litre fuel tank that is too tiny, considering the bike is being pegged as an adventure tourer. Nevertheless, it should be good enough for a range of around 300km on a full tank. Fuel efficiency is even better in the city where the G 310 GS returned 37.39kmpl. That's due to the motor’s ability to run relaxed in fourth gear at speeds below 50kmph. In fact, the motor is so tractable that you can potter around in fifth gear at speeds as low as 35kmph. However, you will have to downshift a couple of gears for a quick overtaking manoeuvre. The motor lacks punch low down for off-road riding. This means you have to use more throttle to keep the motor in its powerband and that makes you work a lot harder for your share of fun. The motor does not impress either in the performance or refinement department. Given its adventure touring nature, we expected it to be tuned for mild off-road riding or at least more refined sustained touring. Unfortunately, it is neither. On paper, the BMW G 310 GS’ underpinnings sound fantastic. It gets a lightweight trellis frame with long travel Kayaba front upside down forks and rear monoshock. The suspension gets 180mm of wheel travel on both ends which is way longer than the Kawasaki Versys-X 300’s 130mm front and 148mm rear wheel travel. It also gets 19-inch front and 17-inch rear wheels. On the road, it is a different ball game though. For starters, the front forks and rear monoshock are softly sprung and offer a smooth ride over uneven bumps and small potholes. But they do tend to bottom out quite easily on anything rougher. You can adjust rear preload, but to access that you need to unscrew an entire panel. We set up the adjustment to the fourth setting from softest but even with that, the rear suspension continued to bottom out easily with a pillion onboard. It works fine in the city, but you will need to get used to the back and forth rocking motion every time you accelerate and decelerate. The larger 26.7-degree rake makes the bike more stable at higher speeds, but in the city, the front feels a tad slow to react to inputs. The larger front wheel adds to the front end weight and slightly increases steering effort. It isn't much though and won't bother you in city traffic. The G 310 GS gets on/off-road biased 110/80 R 19 front and 150/70 R 17 rear Metzeler Tourance tyres. They offer fantastic grip on the road and despite the taller stance of the bike, inspire confidence while taking corners at high speeds. Push it hard though and the top-heavy nature and soft suspension plays spoilsport, forcing you to roll off the throttle. Braking is via a 300mm front disc clamped with a radial caliper and a 240mm rear disc. The setup is similar to the Apache RR 310, but doesn’t feature petal rotors and gets a dual-channel ABS developed by BMW itself. Under our brake tests, the G 310 GS covered 51.60 metres before coming to a standstill from 100kmph and 20.02 metres in 60-0kmph. These are fairly good braking distances. In fact, they’re even better than the Kawasaki Versys-X 300’s 100-0kmph distance of 66.65m. It feels like BMW has tuned the brakes for a more progressive feel to suit off-road riding and it works quite well in most conditions. You also get a round grey button on the left side switchgear to deactivate ABS on the rear wheel for some off-road fun. Off the road, the tyres offer fantastic grip on loose surfaces and the large 19-inch front wheel tackles obstacles well. It has enough ground clearance to clear small rocks, but a lot of other factors spoil the fun. First off, the handlebar is set quite low making you put weight on the front while standing on the bike. This and the super soft suspension means that the front end bottoms out quite easily. As a result, an unanticipated jump could have the front wheel buckle and have you faceplant on the ground. Given the GS lineage, expectations from the GS as a proper mini ADV were high. However, it fails to impress on many counts. For starters, the motor lacks punch lower down the rev range and is vibey, which makes attempting off-roading or touring mildly taxing. The extremely soft suspension tuning means it bottoms out easily and can’t really be hustled on a twisty road, Where it scores is in the styling and quality department, but misses the mark on the features front. Having said that, the BMW G 310 GS is not a bad bike. It just did not live up to our expectations - expectations that come from experiencing the larger GS bikes. Expectations that are not unfounded given that BMW is asking Rs 3.49 lakh (ex-showroom) for the G 310 GS, putting it in quite a premium space. This could even be considered fine for now, but considering that you have KTM’s 390 Adventure set to debut this year, and the fact that KTM nails their performance, features and pricing proposition better than everyone else, this baby GS certainly looks like it’s in hot water. Now if only the BMW G 310 GS was priced Rs 70,000 lower.